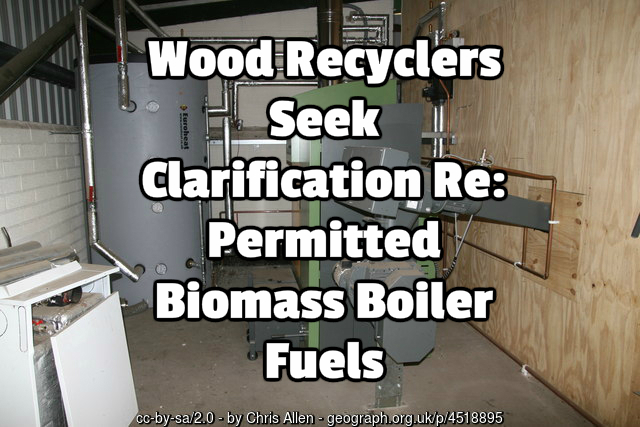 A recent development in biomass boiler fuels and the fuels permitted in the UK is that Wood Recyclers are seeking clarification regarding permitted Biomass Boiler Fuels. 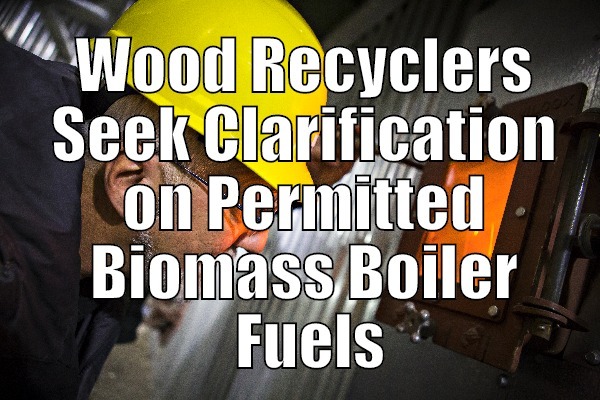 Rising use of recycled wood in biomass boilers as a heating fuel is part of an accelerating trend in which society keen on reducing the effects of climate change is turning to biomass for boiler fuels. The last five years has seen a revolution in how governments, people and industry view energy. The positive aspects of biomass energy have come to the forefront in this discussion, not least the simplicity of using biomass for heating. The primary positive aspect of biomass is it is part of the biocycle of life. This means it isn’t toxic to the environment because it is more or less the environment. An additional benefit is the fact biomass almost always breaks down relatively quickly to its natural elements. This means a biomass fuel spill would be far less damaging than an oil spill, particularly in the long run. The burning of biomass does kick out carbon dioxide among other gases. Carbon dioxide, of course, is a greenhouse gas. Proponents of biomass energy/ wood recyclers, however, argue that the gases produced are not really a problem because they are part of the current biocycle. By this, they are arguing that carbon dioxide is a natural element produced in nature and they are correct. Fossil fuels, on the other hand, are outside of the natural biocycle in the world because they are buried in the ground, which effectively means they are not part of naturally occurring phases. As we dig and drill fossil fuels out of the ground, we are adding the harmful elements found in them to a system that cannot withstand the massive influx. We already use many biomass fuels in our daily lives. 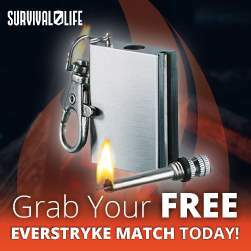 The first cavemen used them to light fires for warmth, protection and cooking. Today, wood recyclers, and the general public as well, use them to power our automobiles. We are referring to bio-diesel and bio-ethanol. Whether you realise it or not, these two fuels have been going into our cars at gas stations since 1990 in parts of the US. The reason is they are used as additives in gasoline for the purpose of cutting harmful carbon dioxide emissions. 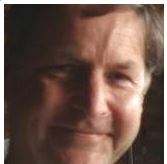 In fact, federal law mandates their use in certain cities such as Los Angeles as well as in most government vehicles. Carbon dioxide produced from vehicles makes up over a third of all the greenhouse gases produced in many developed countries. Bioethanol made from corn cuts these emissions by over 20 percent compared to your basic gasoline. Biomass fuels can cut emissions by as much as 80 percent. Any way you cut it, Wood Recyclers using biomass fuel, is a step in the right direction. So what biomass news shows the progress in biomass, over the last few years? Who Else is Talking About Advances in Biomass Fuel Burning Technology? Discussing the benefits of renewable energy systems especially biomass boilers. How wood recyclers can save money and reduce a home or businesses carbon footprint. There’s been a significant move away from the sole use of fossil fuel heating systems such as … via Are Biomass Boilers Better Than Solar Energy? Recycling benefits our world. You are making an asset regarding reusing. Do not pay attention to those that exist concerning recycling. Exactly what they are stating regarding recycling is absolutely a lie. However in their little tiny little minds it’s the fact.? ?I’m wondering does all the trash just disintegrate or get recycled into something useful?? thanks. this is very informative. Every Country Every City should use this Technology to Save Planet Earth? Recycling is good for our planet. You are making a good point about recycling. Don’t listen to those who lie about recycling. What they are saying about recycling is truly a lie. But in their little world it’s the truth.? Hi you mean 1960 not 1860? This recycling is very good but why not consider incinerators for the rest that can’t be recycled? Much better than landfills!! they’re not actual waste garbage. and people don’t sort because they don’t care enough.? I’m asking yourself does all the garbage simply degenerate or can it be reused easily into something valuable?. You are outstanding this article deserves more than one thousand likes and this is for you.